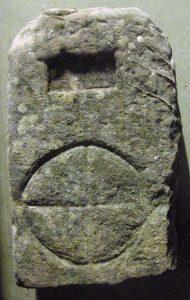 This important early Christian grave marker, discovered by farmer Mr A.M. Paterson on his land at Ballangrew Farm, Port of Menteith in 1975, is evidence of early Christian belief in the Stirling area. It dates from 400-600AD and is one of the earliest surviving Christian stones. It was acquired for the Smith collection from Mrs E.J. Paterson through Treasure Trove in 2007, and is on display for the first time. In historical terms, it is one of the most significant finds in the district, demonstrating that Christianity was practised nearly 900 years before the monks arrived on nearby Inchmahome in the Lake of Menteith. The settlement at Ballangrew on the Flanders Moss dated to prehistoric times, and was a homestead moat made of turf. Until the 18th century, turf housing was not uncommon on the moss lands.